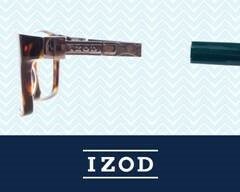 Hauppauge, NY – March 2016 – Eyewear industry leader ClearVision Optical introduces IZOD Interchangeable eyewear, a unique new collection that lets consumers customize their eyewear by changing the temple color to match their look. Designed for those who like to express their own unique style, this youthful, on trend collection includes 4 handmade acetate front shapes in 2 colors and 2 sizes each, and 8 vibrant temple colors, all crafted from lightweight, hypoallergenic TR-90 material. By choosing one frame and two additional temple colors, consumers have the opportunity to create three looks with one frame. IZOD Interchangeable includes a unique, patent pending interlocking system that works like a watch; consumers simply click a button to remove the temple, then slide and lock the new temple into place. Engineered through 3D printing technology, the slim design of the interlocking system was perfected for maximized ease of use by consumers. Use of 3D printing technology streamlined the design process, significantly reducing development time. IZ 6001: A classic rectangle eye shape featuring sharp angles and a metal décor front accent, available in Black Fade with navy blue temples and Blue Fade with tortoise temples. IZ 6002: A modified rectangle shape with a vintage inspired metal décor front accent, available in Green Laminate with green tortoise temples and Merlot Tortoise with black matte temples. IZ 6003: A classic modified rectangle shape with a vintage inspired metal décor front accent, available in Black with white temples and Brown Horn with black tortoise temples. IZ 6004: A classic square eye shape with a vintage inspired metal décor front accent, available in Grey Horn with teal temples and Tortoise with wine temples. Patients will receive their frames and two additional sets of temples in an attractive, custom designed box. In addition, a variety of in-store merchandising materials has been designed to help showcase the collection, and is available through a special introductory program through April 29, 2016. 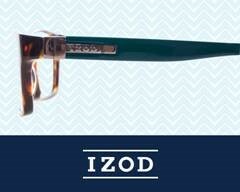 Materials include an IZOD Interchangeable custom display that showcases the four frame fronts in both colors, as well as the unique, patent pending interlocking system and eight temple colors. A lenticular counter card demonstrates how to change the temples. A video series, including a consumer facing waiting room video, is available by request. 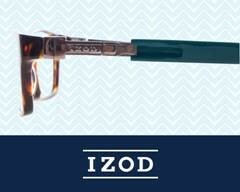 To see the new IZOD Interchangeable collection, visit cvoptical.com, contact a ClearVision Sales Consultant or call 1.800.645.3733. Follow, Like or Visit ClearVision Optical on Facebook, Twitter, Linkedin, Pinterest, YouTube, and Instagram. Founded in 1949, ClearVision Optical is an award-winning leader in the optical industry, designing and distributing eyewear and sunwear for top brands such as Revo, Aspire Eyewear, BCBGMAXAZRIA, Ellen Tracy, IZOD, Marc Ecko Cut & Sew, Op, and Jessica McClintock. ClearVision’s house brands include PuriTi Titanium, DuraHinge, Dilli Dalli pediatric eyewear, ClearVision Collection, and Junction City. A privately held company, ClearVision is headquartered in Hauppauge, New York and has more than 250 associates throughout the U.S. ClearVision’s collections are distributed throughout North America and 20 countries around the globe.